I started this blog in college on a whim. I’ve now been out of college for two and a half years. The blog has, obviously, gone through some growing pains as I have. It’s housed an incredible amount of very different content. Right now, I don’t have any plans to be blogging regularly again. That said, I do have some things I’d like to post. Sporadically. As I write them. Essentially, they’re personal essays. Brain dumps of all my thoughts on a topic, lightly polished. They’re probably all going to be unstructured and slightly rambling. If you follow this blog on some platform, then I hope you enjoy the ride. I know I am. Hey, it’s been a little while since I made a video, but I’m back! For an entire month! All during June I’m posting a video every day – or at least I’m trying to. It’s called Giugno which is Italian for June. Why Italian? Eh, it made the project feel special more than anything else. SO, why am I doing this? I mean, after my failure of a Vlogtober last year, why put this kind of pressure on myself from a hobby? Short version: it’s because I really like making these videos and talking out loud to my camera. Long version: I like making videos, I like making things in general. I like challenging myself, I want to get better at making videos, and I want to get better at editing videos. I bought Adobe Premiere recently, so I need more practice with it. In my 2016 goals video I talked a little bit about the fear of failure and not letting it get me down and prevent me from doing new things. This is one of those new things. Throughout June expect a new video from me every day. And I’ve got some good ones coming. Grazie per guardare, alla prossima, ciao. (That’s just my usual ‘thanks for watching, I’ll see you next time, bye’ but in Italian so it goes with the theme). I’ve gotten a lot of comments saying that I talk too fast, and while I’m trying to work on that it’s just not in my nature. I’m a New Yorker, I talk fast. So as a compromise, I’m adding captions onto my videos and posting all the scripts on my blog. It’s been a while since I wrote anything in this space, so let me catch you up real quick. I work in a library – a small public library in Missouri – and from December through February I’m in charge of our displays. This month, I set up a display themed around reading diversely. February is Black History Month, and where I work the entire staff is white women. Most of what comes across the circulation desk is written by straight, white, cisgender men, and I’d like to see some more diversity. Which is not, of course, to say that straight white cisgender men don’t write great books, plenty do. But plenty of other people do too. Even though this is Black History Month, I chose to do a general diversity theme because I am almost certain that when my quarter of the year on displays ends there won’t be another similar display. I’m only on displays from December-February. So I scoured our catalog (twice actually – lost the first list) and cross-referenced it with a bunch of lists of popular authors from different racial and ethnic backgrounds until I had eight shelves worth of fiction, poetry, and children’s books to display. Eight shelves worth is a ton of books, but there were a few sticking points. While I was able to find a bunch of authors, I also found that we most often only owned one of an author’s books. At least, that held true for authors of color. I couldn’t count on both hands the number of Clive Cussler or Gilbert Morris books we have on the shelves. On top of that I had a really hard time identifying Native Hawaiian, Indigenous Australian, or Polynesian authors. If you know of any, please, leave a comment. Though we had quite a few children’s books by Native American authors, adult books by Native authors mostly eluded me. Ultimately, the diversity display, and the call for diversity in literature in general, isn’t about me. It’s about the little girl who opens up Corduroy and sees a girl who looks like her, or the teenage boy who’s finally drawn to reading when he sees a name like his own on the front cover. It’s about showcasing the stories of people who don’t experience the world in the same way that I do. As a white person with white privilege, it is my duty to use that privilege to elevate the voices of people who do not. If you know of any Native Hawaiian, Polynesian, or Indigenous Australian authors, please, leave me a comment so I can add their books. One thing I wish I had done for 2014, which I will be doing for 2015, is get myself a couple of challenges. These are different from goals or resolutions (which I don’t really make) because they have concrete steps built into them. My challenge for 2013 was to graduate from college. This doesn’t have much to do with the post, but that’s my planner for next year. Decide on an area of your life where you want a challenge, first. Do you want a fitness challenge? A travel challenge? A career change challenge? Maybe you’re struggling to fit your hobbies in with your job and school and family. A hobby challenge (maybe photo a day?) will help you keep them in your life. Maybe you’ve moved to a new city and haven’t seen much of it yet. With a little searching you can easily find a list of the best sites to see, and make that into a challenge, or maybe there’s already a challenge for your city! For 2015, I will be participating in the Pop Sugar 2015 Reading Challenge. (You can find the Pop Sugar post here, and I will be uploading a video about it too!) This amounts to 50 books (or 52 depending on how you interpret the trilogy point) to read during 2015, but it’s more limited than that. This challenge presents 50 specific types of books, including a graphic novel, a book by a female author, and a book more than 100 years old. 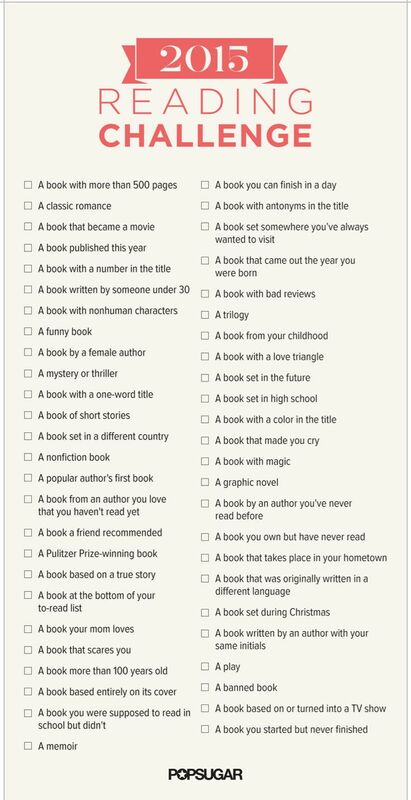 For a different reading challenge you could choose the Rory Gilmore reading list, but that is 335 books long so you may want to choose one season or an arbitrary number of books from Rory’s list. If you’re not into being restricted in your reading, you could try a GoodReads 50 book challenge. You can actually personalize that to any number of books that works for you, so if 50 seems too high or too low, you can change it up. (This year I said 40, but I didn’t take it very seriously, and I didn’t reach it). 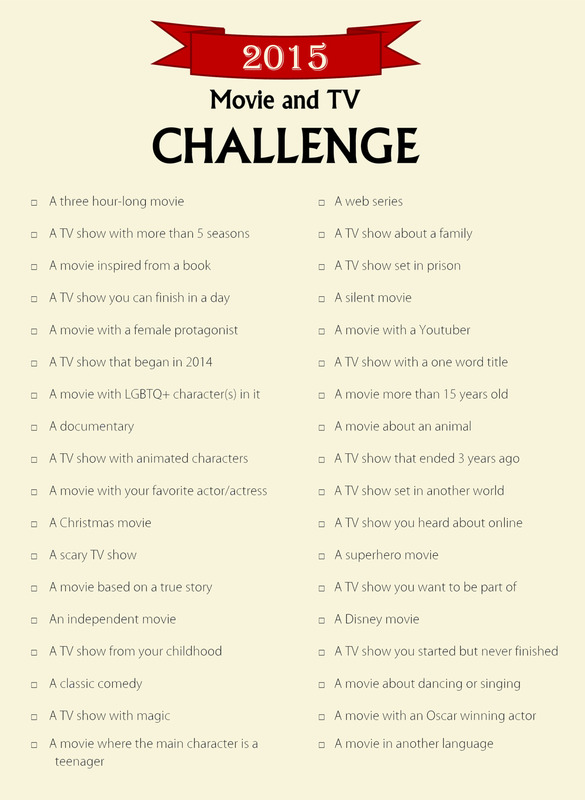 A fellow Creampuff on Tumblr, Juli, made this incredible 2015 TV & Movie Challenge, if that’s more your speed. Much like the 2015 Reading Challenge above, this has different categories, and requirements for completion. (Sidenote, don’t know what a creampuff is? You need to watch Carmilla). If you’d prefer a fitness related challenge, you could try Couch to 5k. Or doing a certain number of 30 Day Shred cycles. If you’re into swimming set a concrete time goal and write out the steps. Writing an entire novel is a great challenge, if it’s something you’re into. Nanowrimo and the Office of Letters and Light could get you started. Rachel Hawkins (author of one of my favorite series) and Victoria Schwab (author of the incredible Near Witch) have a system involving stickers and a calendar which you could adopt. I recently adopted Rosianna Halse Rojas’ 100 Jobs Challenge from 2012 but have since given up because I got a job (actually, since I wrote the draft of this post, I got two! more info to come). I’ll probably pick that back up when my seasonal job ends, though. If you’re in need of a career change, or just a career in general, this would be a great one. For a career change, though, I’d recommend getting some clear steps in mind before you attack applications. For more about career searching, keep your eyes open for Job Interview Week next month. January is all about that Job Search for many of us. I’d recommend picking a couple of challenges to keep yourself motivated. I’ll probably pick a fitness challenge as well, but I haven’t decided what yet. 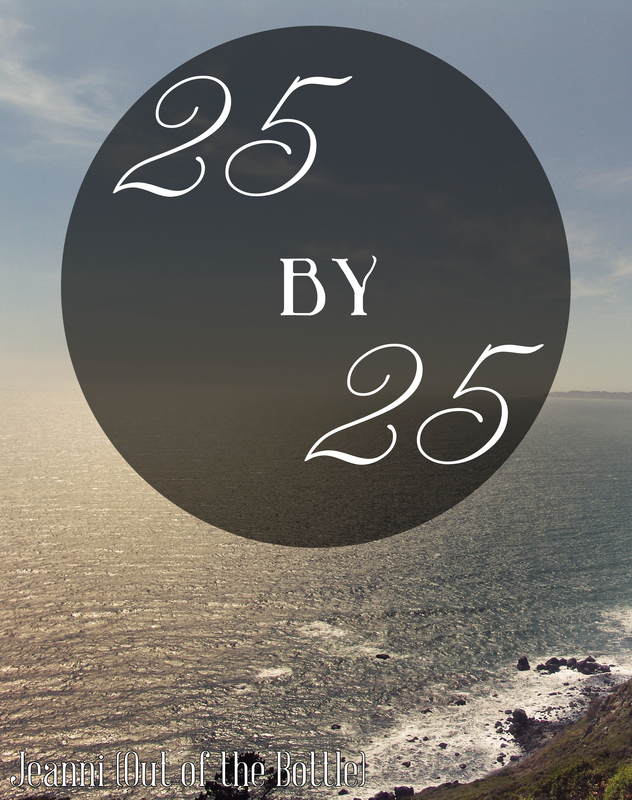 If you want something more long term, create a 25 By 25 style list of goals. I recently-ish revised mine to reflect my current priorities. Maybe I just prefer challenges to resolutions because I’m competitive. I am both a Leo and a younger sister, after all. Let’s talk about planners. I am the ultimate planner nerd. I’ve had planners since I was like 10, although I’ve only consistently used them in college and since. Bring me your planner questions! First, let’s decide what kind of planner works for you. Do you want a ring bound? A wire bound? A regular bound? I’ve used all of the above. Generally my favorite is the ring bound, because you can always add pages, but for 2015 I’m using a bound planner from Target. (In fact, it’s this one). Do you need to have your notes in the same place as your planner? Then a ring bound might be for you. I usually ended up carrying a separate notebook anyway, so I didn’t use the notes section of my ring bound planner as much as I theoretically should have. Next we need to decide is what size planner you’ll need. I’ve used tiny planners, but I don’t like the lack of space. I’ve used big A5 planners, but they’re hard to carry around everywhere. Usually I default to something about the size of a personal Filofax – 3.7×6.7 inches. For a ring bound planner, keep in mind that your actual binder will be larger, which is part of what makes them even bulkier. If you always carry an enormous purse, I suppose it won’t make much difference, but I also like to be able to grab a small one and just go do my errands. Maybe stop by the bookstore or the library. So I like medium sized planners. If you’re responsible for multiple people, especially kids, you might want a larger planner than I do. Once you’ve decided what size planner you need, and what kind you want, the fun part happens. You get to shop for a planner. I used three different planners in 2014, and none of them were quite perfect. 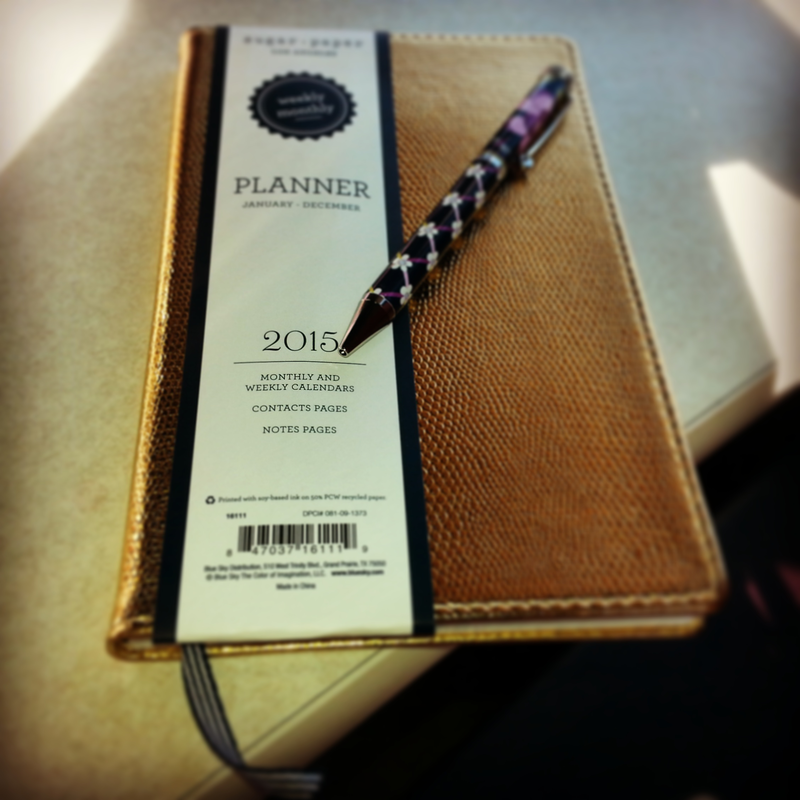 I like to shop online a bit for planners before I go and actually buy one in a store. Target has a great selection, both from the Sugar Paper LA line and from their regular line. (I honestly debated whether I should spend the $8 on my new planner for a really long time, but I love it so much I decided it was worthwhile). Barnes & Noble also has a good selection, as does Staples. If you’re in the Filofax game, you should look around online first because buying from their website is very expensive. I recently came across the Passion Planner. If I didn’t already have my 2015 planner, I might have bought the Passion Planner. It was created by a young woman who felt lost for years, and then created the planner to work herself out of that lost feeling. I think it looks gorgeous, and fascinating, and incredibly useful. You can even try it out for free! If you’re like me, though, you’re too nervous to buy a planner without reading a bunch of blog posts about different types and different specific planners. One of the best planner blogs is Plannerisms. For Filofax planners specifically, there’s Philofaxy. If you like the look of a Filofax, but also think it looks a little boring, check out Gala Darling’s guide to Filofaxes. Trust me, Gala never does anything boring. This year I chose a bound, pretty, Sugar Paper LA planner from Target because I kept coming back to it. I’ll probably bring a small notebook with me everywhere so I can make notes and have an overall to do list from which I choose that day’s tasks. I know I’ll need that notebook because I’ve tried all different kinds of planners before, and I know myself. Try different kinds of planners, you’ll learn something even if you hate that particular planner. For more about prepping for 2015, watch this space. Don’t worry, I’ve only added my twenty-fifth goal, finally. I’ve had only 24 for a month and change, and I finally figured out my twenty-fifth a few days ago. And then I achieved it. (I’m making a video about this soon, so keep an eye on my channel). Move into my own apartment not with an immediate family member. (Roommates are cool). Visit 2 new US cities. Buy a subscription to Evernote Prime. Attend a Phi Sigma Pi conference. Try out a notebook planner. (March 2013, I don’t like it). Complete my master’s degree. (Enrolled at SEMO for Secondary Education). Build my own website. (Not just a mockup). Instead of birthday gifts, ask for donations to charity. To be clear about that last goal, everyone’s pride is different. Mine is definitely one of my biggest weaknesses, and I see why it’s considered a cardinal sin when I think of how proud I can be. So getting a job that I’m proud of enough to put it on my LinkedIn page and display it to the world, not just mentioned in text messages where I’m always qualifying why I have it, is a really nice feeling. It seems like the last couple of months I’ve been achieving goal after goal, and taking steps toward other goals, like making a plan for moving out, or creating a savings goal spreadsheet, or deciding on what my first tattoo will be when I finally find an artist I’m comfortable with putting needles and ink to my body. Have you been meeting your goals? Tell me all about your goals in the comments! Let’s chat.